Russia is one of the few countries in the world where intellectuals existed as a social group and shared a unique social identity. This book focuses on one of the most important and influential groups of Russian intellectuals - the 1960s generation of shestidesyatniki - often considered the last embodiment of the classical tradition of the intelligentsia. They devoted their lives to defending 'socialism with a human face', authored Perestroika, and were subsequently demonised when the reforms failed. It investigates how these intellectuals were affected by the transition to the new post-Soviet Russia, and how they responded to the criticism. 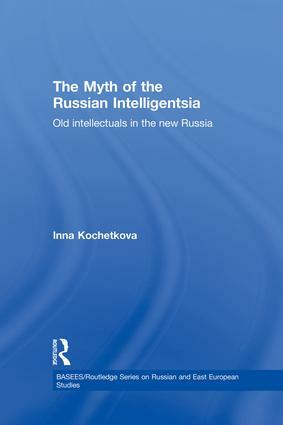 Unlike other studies on this subject, which view the Russian intelligentsia as simply an objectively existing group, this book portrays the intelligentsia as a cultural story or myth, revealing that the intelligentsia's existence is a function of the intellectuals' abilities to construct moral arguments. Drawing from extensive original empirical research, including life-story interviews with the Russian intellectuals, it shows how the shestidesyatniki creatively mobilised the myth as they attempted to repair their damaged public image. Inna Kochetkova is Lecturer in Qualitative Research Methods at the University of Bradford, UK.